It is news to no one that your dealership's mission is to Obtain and Retain Customers in every profit center, maximized for every Ad Dollar you spend, by getting the best possible results from every “Customer Contact”... Right? For many car dealerships the advertising cost to make the phone ring is well over $100 for each sales call… Agreed? "Can I Become Your Customer?" "Can I Remain Your Customer?" Consider the road blocks to answering either of those two questions in the positive for auto dealers right now, and ask yourself where your business is failing the mission. With the steady increase of web generated phone call/lead form ratios, more than ever before, in today's car dealership the Phone Process and Mechanics, as well as the Phone Skills of those handling incoming calls are the determining factors for Obtaining and Keeping customers, growing market share and driving profitability. 40% of Sales Callers never reach an agent on the inbound call. 57% of the Callers that do reach the agent they're calling for, don’t provide us their Contact Information. 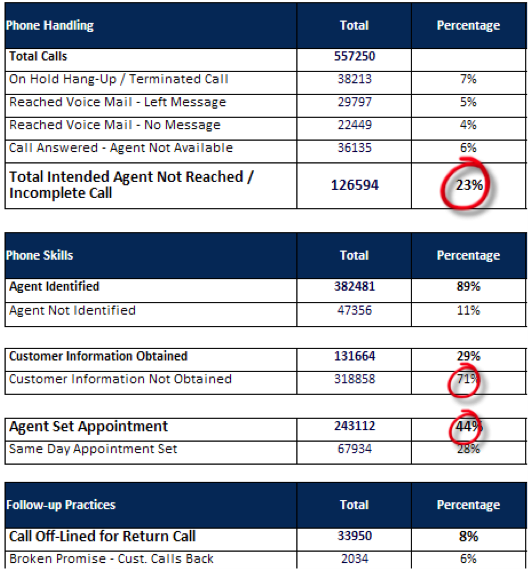 20% of Sales Calls set appointments, leaving 80% un-appointed with little chance to follow up. 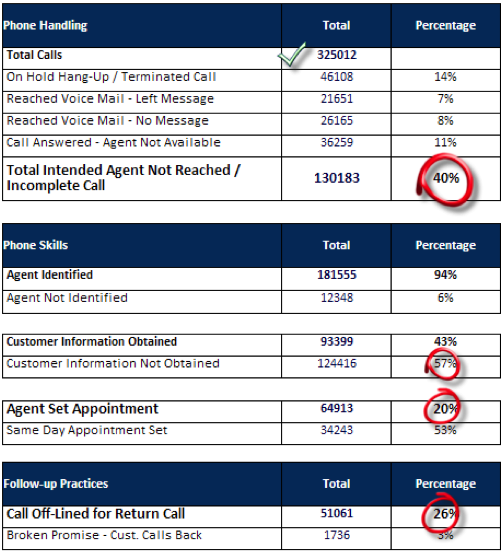 26% of Sales Calls are “Off Lined” with promises of call backs. 25% of Connected Sales calls are entered into CRM, owned and triggered. 60% of Service Price calls are answered without an offer for an Appointment. 71% of Service Callers are not asked for updated Contact Information. These shocking but very real performance metrics beg the question: What are the phone mechanics you could put in place to improve on these numbers that directly impact the financial statements at your dealership? Before you spend an additional dollar on Marketing, Advertising or Social Media campaigns designed to make your dealership's phone ring, consider measuring and improving what is clearly THE number one contact point for your customers. The effectiveness of your dealership's phone mechanics and the "Caller's Journey" that customers experience will dictate whether or not your profitability is being maximized. Chip King, owner of CallRevu, LLC, spent his career in automotive retailing from 1977 to 2008. Holding every position in variable operations, including General Manager and Dealer Principal, King has had a special focus on the “customer experience” throughout. CallRevu was born in 2006 to manage the age-old and biggest profit leak in the retail auto business – the phone. CallRevu has since grown to a staff of over 250, and serves dealerships across the U.S.
Chip is a highly sought after subject matter expert for many of the auto industry's biggest and best dealer conferences such as NADA, Digital Dealer, AutoCon, Automotive Leadership Roundtable and others. He is passionate about sharing his expertise with dealers and managers on how to correct the top profit leaks in the auto dealership phone process. This is great data. CallRevu is a must for any high volume call center operation. The tool is incredible. The numbers don't lie. Sad when you think about how much money is being wasted on advertising that results in a botched opportunity because a dealership employee did not do their job on the phone. The time to fix your phone process is now! Great article as always Chip! Good info. Great to read about how dealers can increase profits by better handling the customer contacts they have. During the two months immediately prior to AutoCon, I was calling between 10 to 50 dealership every day of the week... My purpose was to convince dealers, GM's, managers and professionals in each dealership to attend AutoCon. The single biggest eye opener I received during that time period was how consistently horrible dealerships handle inbound phone calls. It really blew me away! I was amazed at the daily mishaps with dealers and their people handling my phone calls... disconnected on transfers, put on hold and never taken off, messages given to employees that never reached the intended recipient, sent to the dealer or GM's voice mail only to be greeted by a service adviser's recorded greeting, calling the dealership's advertised and listed phone numbers only to have the phone ring continuously without being answered, listening to people talk about getting drunk while the person who answered the phone THOUGHT his hand was blocking me from hearing the conversation... I could go on and on, but like I told Chip King while we were at AutoCon, I cannot think of a single business functional area in dealership operations that has a greater widespread need for improvement than incoming phone call handling. Chip and his team at CallRevu provide solutions that include the "emergency room" for broken phone process where management can at least be alerted to all the mishandled customer calls on an immediate "near real-time" basis so they can reach out and salvage a few sales every week. Excellent article. Ask the tough questions! We must all constantly review our process and people. Well done Chip! How does this data compare to say 5 or 6 years ago? This comparison may prove eye-brow raising to dealerships not yet abreast to attending properly to this fast changing digital age. Tom--Great question, I wish we had that data.....On the mechanics side, I would conjecture that connectivity is a bigger challenge now than ever. Most business have remained dedicated to the dreaded "Phone Tree" and "Auto Attendant" concepts to manage the hugely increased call volume...in most cases with dramatic failure to serve the customer. The demand for live voice answers is overwhelming---even being promoted by Banks and Credit Card companies in TV ads...To quote and old movie, "Our customers are Mad as Hell, and they won't take it any more!" There are Dealers that are listening and the differentiation grows market. Period. Thanks Chip. The "Phone Tree" and "Auto Attendant" proved timely and welcome excuses to avoid conversation unless absolutely necessary. For too many, reverting back is like quitting drinking by one in denial who doesn't hear or refuses to listen to current health hazards and take positive corrective action. I HATE being the voice of doom and gloom but if you run the report five years from now, you will get the same results. It has been the same way with internet response Matrices. There is a reason why dealerships fall into the following groups: Market Leaders, Average Performers and Subpar dealerships. Market leaders give their people adequate tools and they use them. They feel responsibility for their people's success and train them. Honestly, I don't have a dog in the race. I don't represent a call tracking company and I leave the phone training to experts like Jerry Thibeau. By having a strong call to action, you can increase the number of sales calls. Nothing makes you look more foolish than poor preparation.